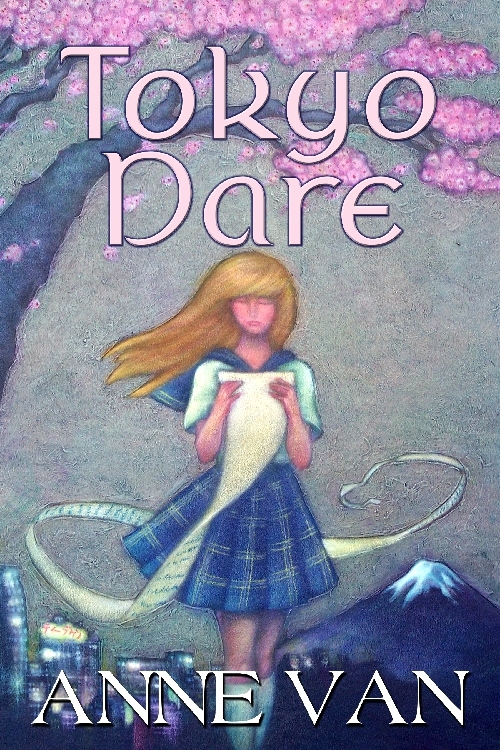 Today I have Anne Van with me to discuss her debut novel Tokyo Dare! VW: How long have you been writing Young Adult? AV: I’ve been writing YA for five years. I love the genre. Seems I never grew up. VW: Where you did you get inspiration for Tokyo Dare? AV: I’ve lived in Japan, travel a lot, and met some amazing people. I’m a very curious person, which makes me wonder off the beaten path. This usually leads to wonderful discoveries like secret temples and hidden neighborhoods, but sometimes leads me to some places I’d rather not find like the spot where the village people dump their jars of rotten pickled eggs. Yuck! VW: What was it like living in Japan? AV: Scary and amazing at the same time. I didn’t know the language when I first got there. Because my host family lived out in the boonies, not many people spoke English. So I had the resort to hand signals. I also became a speed demon with my English to Japanese dictionary. I had to learn fast to survive. Maps and landmarks are vital in Tokyo, which is a crazy labyrinth of streets and train stations. Japanese people bend over back wards to help you which is awesome. I was lost once and I asked a woman at a small food market for help. She stopped her grocery shopping and led me to exactly where I needed to go. It was a 20 minute walk from the store! This over the top kindness happened too many times to count. VW: How different where your experiences in Tokyo from your character Erin in Tokyo Dare? AV: Writers write from life experiences so I pulled from my own time in Japan. But Tokyo Dare is fictionalized so I gave things to Erin that I didn’t have right away when I was in Japan. Like two awesome BFF’s Gina and Setsuko. It took me a lot longer to make new friends than it did for Erin. I wanted her to have advantages I didn’t have. That’s the great thing about fiction you can write your dream version of what happened. VW: What project are you working on now? AV: I’m working on book two of the Sushi Chronicle Series. Erin has her dream boyfriend and is doing well in her second semester at Seda Academy. She’s even making progress on her crazy to-do list. She’s moving out of the host family from hell! But just when she thinks she’s settling into her life in Japan a string of events turns her world upside down. VW: Are you planning a sequel? AV: Yes, book two will be out next year. Thanks for having me Vicky. Sixteen-year-old artist, Erin Van Horn, doesn’t know an Unagi Roll from a Kaiser Roll. But on a dare from her best friend, Tori Mukigawa, she wins a spot as an exchange student at a prestigious Tokyo high school. Once in the land of the rising sun, Erin struggles to learn the culture and deal with a host family from hell. Otosan, the father, stops speaking to her after she “murders” his favorite bonsai tree. The mother, Okasan, believes Erin’s evil because she’s left-handed and their son is an Elvis impersonator who is convinced Erin’s the spitting image of Priscilla if only she’d dye her blonde hair black, and become his child bride. Anne Van is an artist, fashionista, turned writer. She has a Masters Degree in Fine Art and attended Waseda University in Tokyo Japan on a scholarship. She has exhibited her artwork all over the United States and one of her works was displayed in a museum in Picasso’s hometown of Malaga, Spain. After several years toiling as a fine artist, she switched gears to pursue another passion, fashion. Anne graduated from FIDM in Los Angeles and designed sportswear for major retailers. All the while she heard stories in her head. So one day she quit fashion and finally put her stories on paper. Since then Anne has published an article in a national magazine and an award winning travel story about her time living in Tokyo, Japan. She has also published short fiction. Anne continues to write the stories that fill her head. She lives in a Victorian home in a historic landmark district in Pasadena, California along with three rescue cats, including one that has six toes, and her TV composer husband who thankfully doesn’t. This book makes me want to go to Japan asap! Looking forward to the sequel! It does sound like a crazy place! Interesting to read about your time in Japan, Anne! I am tone deaf when it comes to foreign languages, glad you fared better. I can’t do languages either ! LOL Ann! I’m lucky I have a good ear for languages! I’m so excited that you posted this, and so glad that Anne’s book is doing well! I spent a year living in China, and I desperately wanted to write about it, but every time I started, I just got stuck. Then I decided to write a YA fictional account of someone ELSE going to China, and writing got much easier. I could fabricate the details, but still use my own experience to fuel the story. I really hope I can publish my story when it’s finished and have as much success as Anne has had! She’s living the dream! 😀 I definitely want to read her book now! Good luck with your book, sounds exciting! Rachel so glad you are writing about your experience in China! Fiction is so freeing. You can live the dream too! Thanks for stopping by and your interest in Tokyo Dare!